No credit card or payment information is required to request or activate a free trial. There is no obligation to purchase MIDAS at the end of your trial period, and you won't be automatically billed. To register for and activate your free trial, we require your name, the name of the business/organization you'll be trialing our MIDAS software on behalf of, that business/organization's website, and your email address within that business/organization. You will need to register using your email address within your business/organization. Trial registrations from free email providers are not permitted. If your official business email address is provided through a free email provider, please contact us instead to arrange your trial. Trials of our software are offered for a maximum period of 30 continuous days from date of activation. In some instances, it may be possible to request a short extension to a 30-day trial when it's nearing its expiration, but there is no guarantee that we'll be able to accommodate such requests, as a finite number of trial "slots" are available at any given time, with priority given to new trials over any extensions to existing trials. Only one trial period is permitted to each individual business/organization. Requests for a subsequent trial for a business/organization who has previously trialed MIDAS will only be granted in exceptional circumstances (such as significant new features/changes having been implemented in our software since the time the business/organization's previous trial period ended). 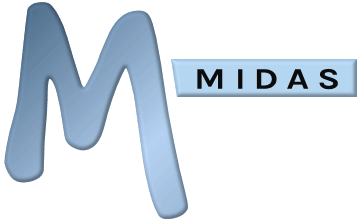 Data entered into a trial MIDAS system is kept in accordance with our Data Retention Policy. Should you go on to purchase MIDAS before the end of your trial period, you may request that the data/settings entered into your trial system be made available in your purchased MIDAS system, allowing you to continue in your purchased system from where you left off in your trial system. Should you go on to purchase MIDAS after your trial has expired, we cannot guarantee that the data/settings previously entered into your trial can be made available in your purchased MIDAS system. Therefore if you wish to have trial data/settings migrated into a purchased MIDAS system, rather than start from scratch with a fresh system, you should purchase before your trial expires. We reserve the right to suspend access to your trial MIDAS system, without prior notice, should we detect, receive reports of, or be concerned about abnormal usage or suspicious activity occurring within your trial MIDAS system, and/or activity which could degrade or otherwise adversely affect the quality of service we provide to our other "hosted" customers, and/or if we have reason to believe that these Terms & Conditions have been breached. By registering for and activating a free trial of our room booking and resource scheduling software, you fully understand and accept these Terms & Conditions.